Catania is the second-largest city in Sicily located between Messina and Syracuse. It is known for the wondrous power of Etna, its snow-capped peaks, crystal clear sea of the Ionian coast, the historical and archaeological heritage, the Baroque churches and palaces, food traditions and music and an innate warmth and hospitality culture. This great mix makes Catania an ideal base from which to explore the region if you hire a car. 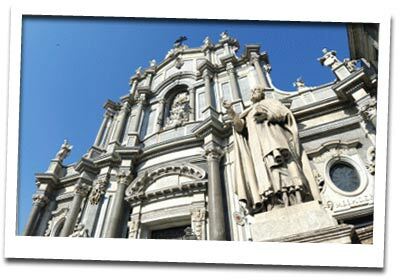 Catania has a lot to offer to lovers of architecture; the main styles, evident in the region, are ancient Greek formations like the Greek-Roman Theatre of Catania, the Odeon that could house up to 1500 spectators, ancient Amphitheatres and Christian basilicas and burial monuments and Catacombs. Catania can also boast some majestic ancient Roman thermal structures like the Achillean Baths, Terme della Rotonda, Terme del Palazzo dell’Università and Terme di Casa Gagliano just to name a few. Catania is also famous for its Renaissance and Baroque architecture as its Baroque city centre is classed as a UNESCO World Heritage Site. One of the main streets is Via Etnea that offers tourists a great opportunity to soak the city ambience and its folklore. Along the Via Etnea we can find seven churches starting from the Cathedral in Piazza Duomo continued with the Basilica of the Collegiate Church of the Child, the church of San Biagio, the church of SS. Sacramento, the church of Sant'Agata al Borgo and the Church of Badiello. Beside the churches, along Vie Etnea we can also find many palaces, public buildings and avenues that reflect its 300 year old history and the architectural evolution. Each avenue will offer you a variety of elegant shops and restaurants giving an opportunity to taste some local cuisine specialties. A must for any visit to Catania is trying one of its typical local delicacies that are often found throughout Sicily. Your gourmet journey can begin by discovering the Catania tastes with a famous dish: Pasta alla Norma. This is a pasta first course, usually with tomato sauce, fried eggplant, basil and lots of salty ricotta cheese. You should also taste a typical Sicilian pizza with anchovies and tuna. However, there are many more dishes on the menu, and Catania offers loads of great places to taste it all, and to visit them all it is a great idea to hire a car. If you are more interested in exploring natural sites take your hire car towards one of the main tourist attractions of Sicily - the very active volcano Etna, located only 32 km away from Catania. The craters below the summit can be reached from the town of Piano Provenzana located at the base of the mountain. This town offers also a great ski resort in winter, where you could plan your next winter holidays. Exploring the area with your car hire in winter season and hitting the slopes in the shadow of active Etna would offer definitely a great adventure with an added thrill. Although Catania has a lot to offer there are also many other must-see attractions in the area and to visit these you’ll need to hire a car. If you hire a car in Catania, you can visit Taormina - the main resort & tourist spot in Sicily. Whilst Taormina can be hot and busy during July and August, crowded with Italian tourists, it is far more pleasant and less busy during the rest of the year. If you are looking for ambient old little cities where you could wander on foot for hours, head with your hire car towards Cefalù which is small fishing village and popular beach resort in north Sicily. Further up north are the Aeolian Islands worth at least a day trip, where you can climb, take mud baths and after long and adventurous day relax in one of its hot thermal sea-water spots. If you are after spiritual thrills do not miss Monreale cathedral just outside of the island capital Palermo known as "city of delights" for its marvelous lavish gardens, as well as for magnificent mosques and palaces. Monreale has on of the most fascinating and beautiful pieces of architecture in Italy - the 12th century cathedral built on the mountain slope about 8 km from the Palermo city center. It offers an astonishing mixture of Byzantine, Arab and Norman styles blending together the key features of medieval Christian and Muslim architecture. Catania has only one airport - Catania Fontanaros International Airport (CTA) located about 5km from the city, and you can hire a car there.